We spent a long day at our Rulo Bluffs property last week. 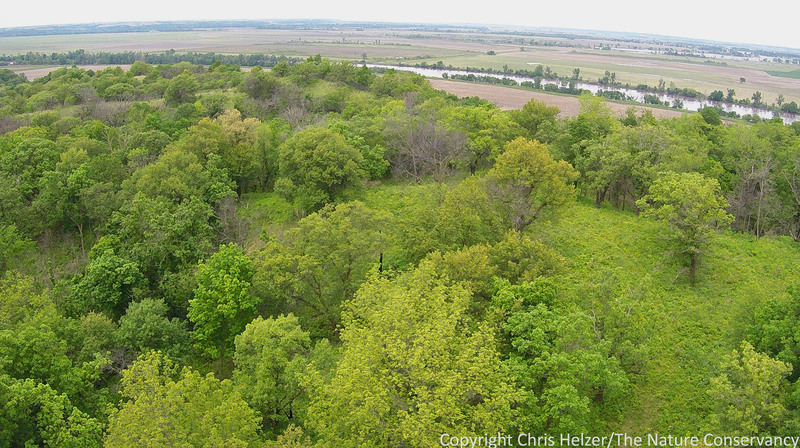 The site is at the very southeast corner of Nebraska, and includes about 450 acres of mostly oak/hickory woodland with prairie and savanna habitat on steep ridge tops. I’ve written before about our work to burn and thin the woodlands to open up the understory layer as a way to encourage higher plant diversity and better wildlife habitat. Last week, Nelson, our land manager, spent the entire day in a rubber-tracked skidsteer, shredding brush along ridges because we didn’t manage to get a fire done last fall or this spring. I got a few overhead photos of his work with our drone. 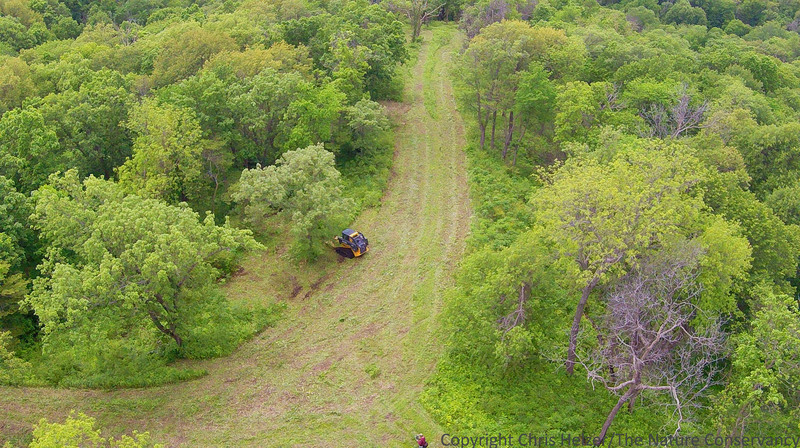 Nelso Winkel shredding brush with a skidsteer at The Nature Conservancy’s Rulo Bluffs Preserve, Nebraska. Using fire, thinning, and shredding, we are trying to allow more light to hit the ground in the woodland, which enhances oak tree regeneration, increases plant diversity, and improves habitat quality for many wildlife species. This photo shows a ridge where we’ve been working for more at least 15 years to beat back brush with fire and mechanical treatments. Nelson didn’t have to shred this area this year because the brush is finally starting to give way to more herbaceous plants. The second image above, taken with our drone, was interesting because it and others from the day showed a surprising number of large dead trees scattered across the property. We knew we were reducing the number of smaller diameter trees with our thinning and fire work, and that a few bigger trees were also dying, but couldn’t see the real scope of that without being in the air. (Couldn’t see the forest for the trees…) While we’re not trying to kill off a large number of big trees, losing some provides space for new oak trees to get started, and provides a number of other benefits – including habitat for the many species that live in standing dead timber. So, it wasn’t a shock or disappointment to see all the dead trees, it was just an interesting observation we couldn’t have gotten without the ability to get eyes up in the air. My main job last week was to be on site in case Nelson ran into trouble with the skidsteer. (That makes it sound like I was there to help fix the skidsteer – nothing could be further from the truth. Nelson has more mechanical ability in his little finger than I could dream of. I was just there to go for help in case he rolled the thing down the hill or something.) While he was doing the real work, I tried to stay productive by pulling garlic mustard, scouting for invasive honeysuckle, and killing small trees with herbicide. I also managed to find a little time for some photography. Here are a few of the photos I took. This is starting to look more like what we want the site to be. A strong herbaceous (non-woody) plant community, including sedges, grasses, and wildflowers, supports better wildlife diversity and also helps facilitate fire to maintain that open woodland character. These paw paw trees were top-killed in our 2014 prescribed fire. they are regrowing from the base, but aren’t yet tall enough to suppress growth of other plants beneath them. 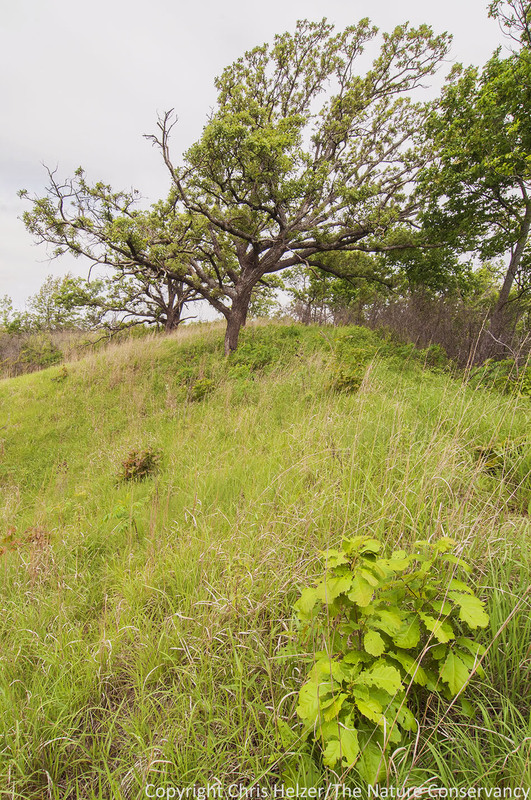 A small bur oak is fighting to establish itself on a prairie ridge as older oaks near the end of their lives. Both in the woodland and savanna portions of the site, this replacement process is critically important. 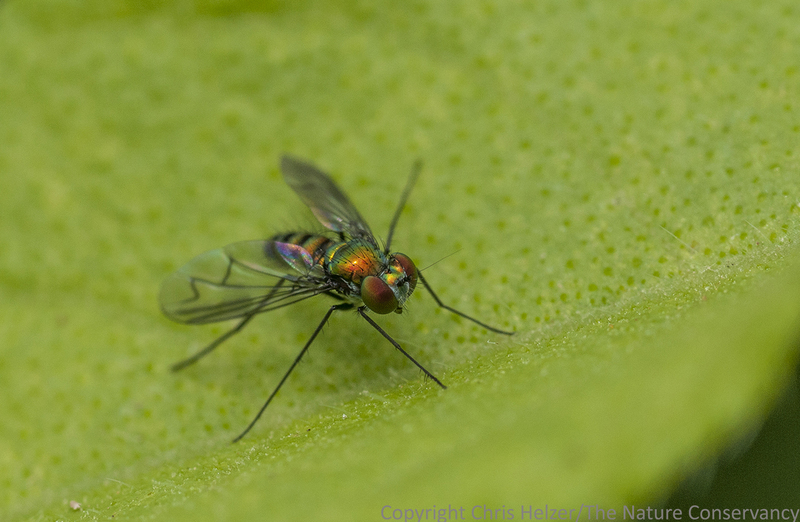 These beautiful metallic-looking flies were pretty abundant the day were at the site. I saw several in the clutches of spiders, but didn’t manage to photograph any of those. A close-up photo of bur oak leaves. I’m not sure what species of bug (and it is a true bug) this nymph is, but it sure was striking against the green leaves it was feeding on. I watched it repeatedly stick its long proboscis into this leaf as it moved across it. 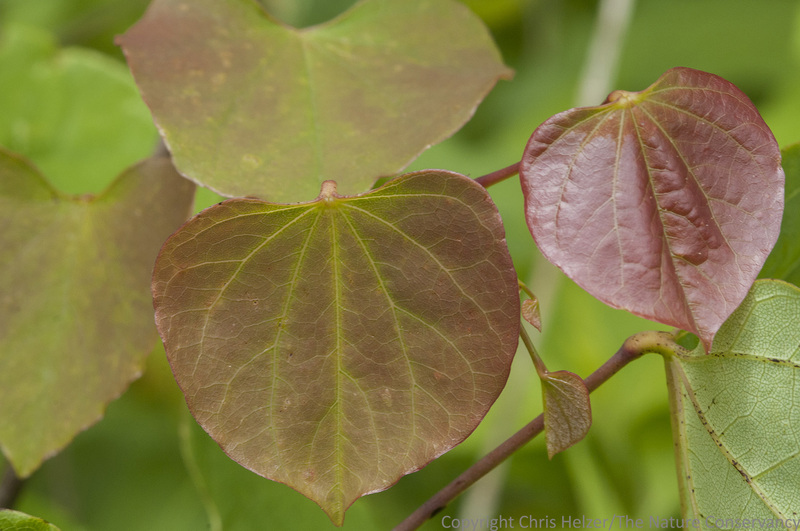 Eastern redbud (Cercis canadensis) is a beautiful tree. Both its pink flower and leaves are very attractive. However, it is also one of the species we are trying to reduce the density of in the understory of the Rulo Bluffs woodland. This beautiful little brown snake was about 10 inches long. I spotted it as it was making its way through one of the areas Nelson had just shredded. There are a couple species of raspberries, or close relatives, at Rulo Bluffs, but I don’t know what species they are. This one was particularly beautiful the day we were there. Because of its long distance from our shop and field headquarters, we never feel like we spend enough time working at Rulo Bluffs. It’s a beautiful site, and one of the best examples of oak woodland remaining in Nebraska. As with other oak/hickory woodlands, however, it requires active management in order to survive and regenerate. 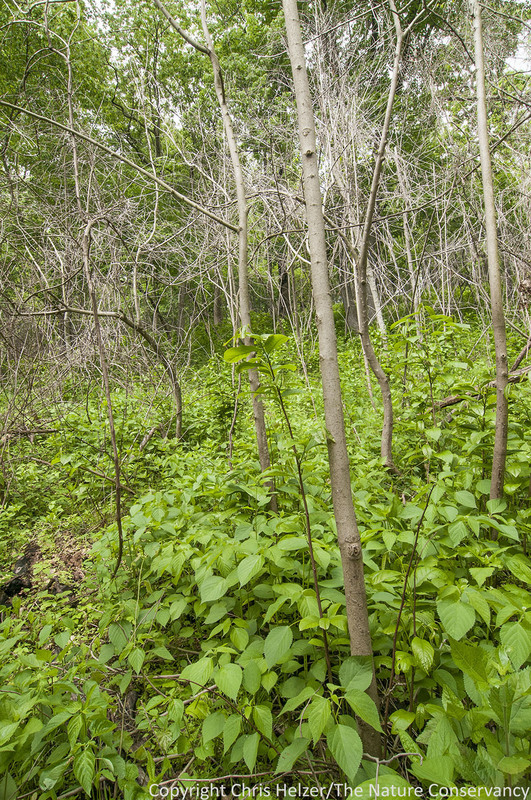 Without frequent fire, or substitutes such as thinning and shredding, the understory at Rulo Bluffs would become choked with small trees and shrubs, such as ironwood, dogwood, paw paw, and others. Those woody understory species block light from hitting the ground, prevent the establishment of new oaks, and choke out most grasses, sedges, and wildflowers. Eventually, if older oaks die without being replaced, these woodlands change into new communities, dominated by trees such as ash, hackberry, and others that don’t create leaf litter that can carry fire. 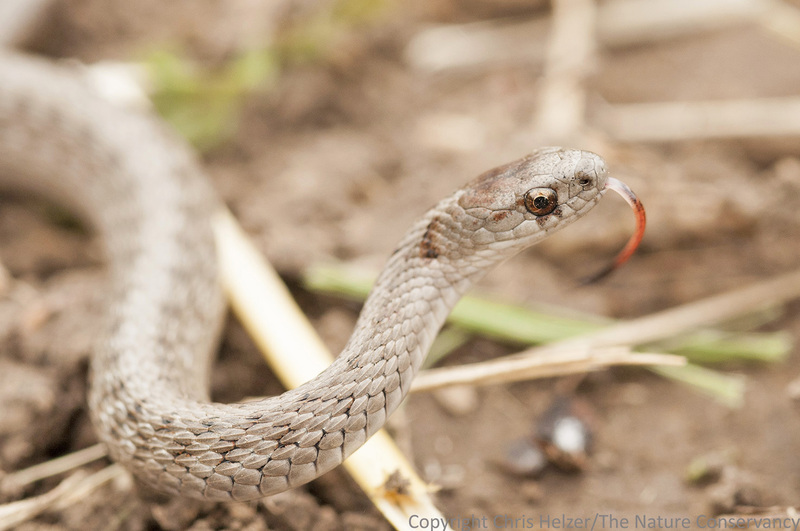 At that point, restoring the oak/hickory woodland community, which supports a much larger diversity of plant and animal life, is nearly impossible. …and that is why we keep trying to find time to head down to Rulo Bluffs. That, and it’s such a beautiful place. This entry was posted in Prairie Management, Prairie Natural History, Prairie Photography and tagged brush, bur oak, fire, forest, management, nebraska, oak hickory woodland, oak woodland, photography, rulo, rulo bluffs, savanna, savannah, shredding, skidsteer, the nature conservancy, thinning, trees, woodland by Chris Helzer. Bookmark the permalink. A great article backed with beautiful photos. A few years ago I visited the area, but never did find where to enter Rulo Bluffs from the paved road (if there is a way) Mainly went to scout for Zebra Swallowtail butterflies in their various life stages. Great to see all the pawpaw. Are there any prickly ash as well, which are host to Giant Swallowtails? 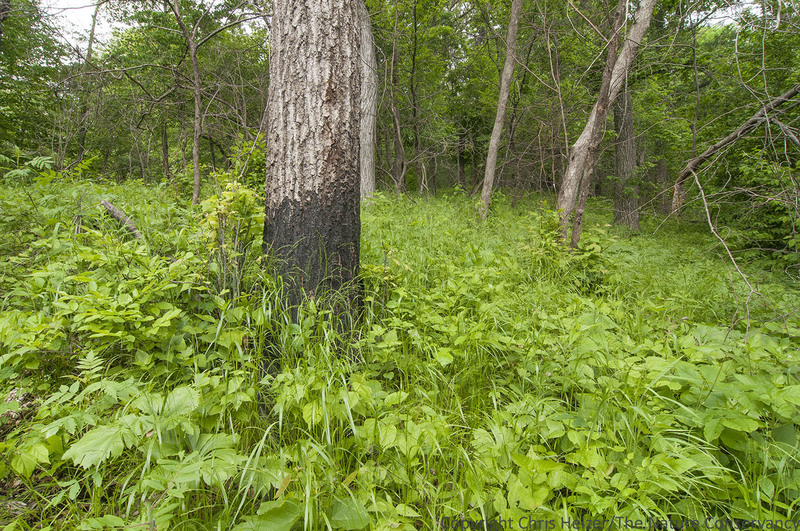 Prior to settlement, any ideas of how often this oak savannahs caught fire? Any tree ring studies by chance? Very nice post and beautiful photos. Richardson County is a pretty part of Nebraska. You probably drove right past the farm where I was born and grew up, between Dawson and Verdon, on your way to the Rulo Bluffs. Too bad I didn’t know you were coming. It would have been good to meet you. Is it correct to re-state then that the two main driving management goals a) higher # of plant species and b) specific wildlife habitat (species of concern?)? I know you have expressed concerns previously about using pre-Euro-settlement conditions as a target, though perhaps this is one case where they might (apparently) overlap. Thanks for taking the time to compose this write-up. Adam, good question. Yes there is some overlap, but our objectives are ecological rather than historic. 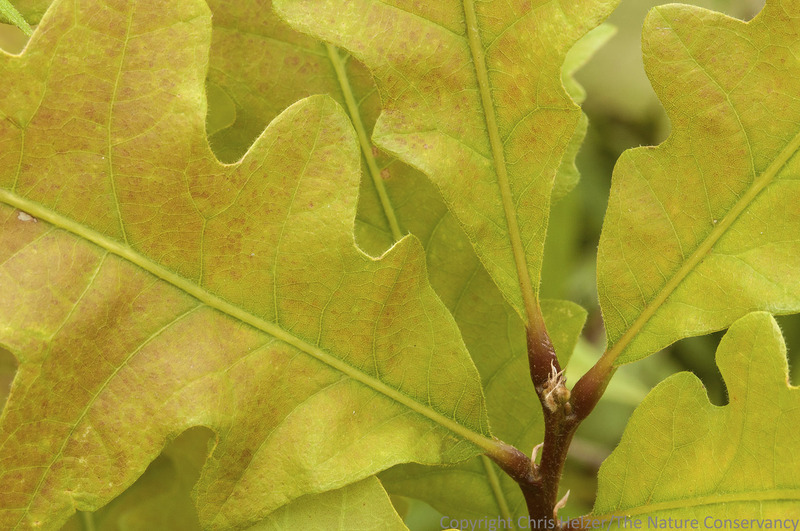 I would say the biggest objective is actually the survival of the oak woodland itself, which relies on oak regeneration, which relies on light availability. 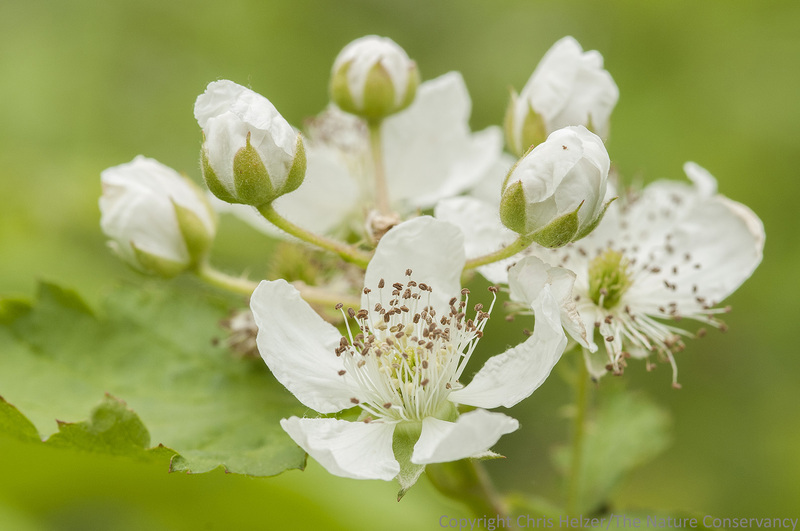 Yes, we also want more herbaceous plant diversity too, but without new oaks, the woodland community type itself will go away – along with all of the species that rely on it. There must be a way to mow higher so the brush is cut below its leaf canopy but the ground layer plants are left mostly uncut. We have joked before about borrowing giraffes from the zoo for such a project. Last summer I saw the IDNR using goats to manage and control brush in oak woodlands. Have you considered any partnerships to try this approach? The main problem with goats is they aren’t selective. Nelson could concentrate his mowing on brushy areas and leaving everything else untouched. Although from the looks of the pictures everything on that hill was probably interspersed with brush. Nelson’s day of work also most likely costs less than renting goats. They have goats, sheep, llamas, and donkeys clearing brush at O’Hare international airport. The airport is paying 20,000 dollars for a two years grazing contract. I now live in a Chicago suburb so I am not as knowledgeable about agribusiness as when I lived in Nebraska and Iowa. I always thought people paid for the privilege to graze. That is not how things work in Chicago. I just started following your blog. Very interesting. Love your macro photography. May I ask which lens that is? Curious. I used to do a lot of flower macro work with the Nikon 60mm macro lens and am curios. . Thank you. Apologies if you addressed that elsewhere! 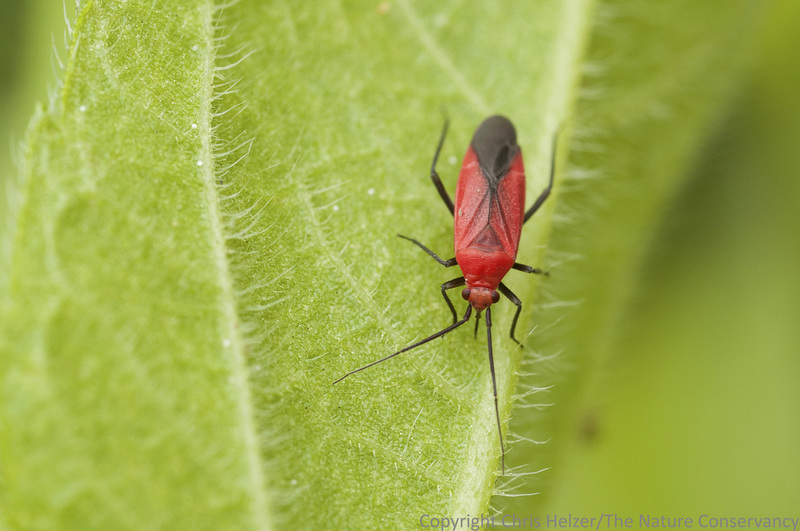 Your bug looks like a box elder to me.